Comments: Evergreen conifer native to Guadalupe Island west of Baja California in Mexico. Pale blue-green scales which are tight to the branchlet and a smooth purple red bark which curls off in small flakes. 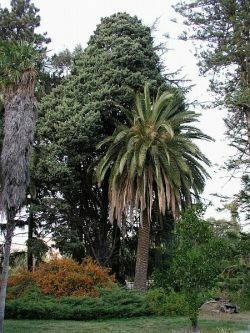 Foliage is similar in look to sequoia giganteum but bark is much different. This species is endangered in its natural habitat, and not widely grown elsewhere. This specimen might have been purchased as early as 1898 from the California Nursery Company.